PR needs to move beyond advocacy and towards becoming educators, Edelman global president and CEO Richard Edelman has said. Richard Edelman presents findings of this year's Trust Barometer. 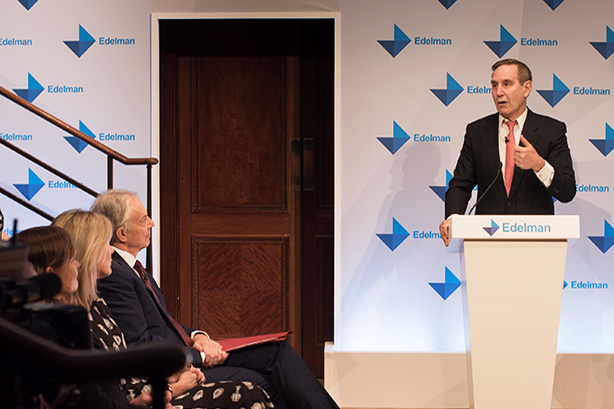 In a presentation of this year’s Trust Barometer, Edelman called on business leaders to ‘stand up and be counted’ and to adopt a new contract between employees and employers "that goes beyond writing a cheque". "[This new relationship] calls for having a mission, purpose and values that the company stands for. Secondly, you need to inform your employees, so that they can be the first out with information," he said. "We want the PR teams to not be advocates, but to become educators." Edelman said employers who can garner the trust of their employees receive much more loyalty, greater advocacy and higher levels of engagement with the outside world. Companies have a responsibility to focus on local markets and "not just be an amorphous multinational". This year’s Trust Barometer found that Britons are far more trusting of their employers than any other institution. Only one in seven people in developed markets believes the system is working, with many turning to their employers to fill the trust deficit in government and other institutions. "There is a fundamental change in the expectation of CEOs," he said. "Employees expect them to focus on fair pay, retraining, diversity and inclusion…[and to] fill the void left by government and act on our behalf." Part of this responsibility will be to help large swathes of the workforce re-train into new roles, with technological advances and robots now cited as a bigger threat to job security than immigration. Former prime minister Tony Blair also cited the next technological revolution as the biggest issue facing business and the society.